To some extent, nandrolone aromatizes to estrogen, and it does not appear that this can be entirely blocked by use of aromatase inhibitors indeed, aromatase may not be involved at all in this process (there is no evidence in humans that such occurs) with the enzyme CYP 2C11 being in my opinion the more likely candidate for this activity. In any case, Cytadren , an aromatase inhibitor, has not been found effective in avoiding aromatization of nandrolone. Deca Durabolin (Nandrolone Decanoate) is a brand name of Anabolic Steroid Nandrolone. It is an injectable form of the Nandrolone. 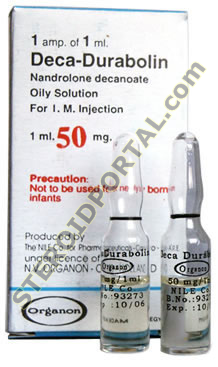 The addition of decanoate ester provides a slow release of nandrolone from the site of injection, lasting for up to three weeks. Nandrolone decanoate was first described in 1960. It was developed by the Organon, and sold under the brand name Deca-Durabolin. When introduced in the United States for the first time, this compound was prescribed for a variety of ailments like pre and post operative use of building lean mass, osteoporosis, advanced breast cancer and weight loss due to disease etc. The mild properties of Nandrolone Decanoate have made it one of the most popular injectable steroids worldwide, highly favoured by athletes for its ability to promote significant strength and lean muscle mass gains without strong androgenic or estrogenic side effects. Deca Durabolin is a brand name of Nandrolone decanoate, which is a modified form of nandrolone, where a carboxylic acid ester (decanoic acid) has been attached to the 17-beta hydroxyl group. Due to ester addition it less polar than free steroids, and is absorbed more slowly from the area of injection. Once in the bloodstream, the ester is removed to yield active nandrolone. Chemical name of Nandrolone decanoate is 19-norandrost-4-en-3-one-17beta-ol-17beta-hydroxy-estr-4-en-3-one. Nandrolone decanoate is very similar to testosterone in structure. Only difference is that it lacks a carbon atom at the 19th position (hence its other name, 19nortestosterone). Like testosterone, it also exhibits relatively strong anabolic properties but its tissue-building activity is accompanied by weak androgenic properties, which is unlike testosterone. Deca Durabolin provides a sharp spike in nandrolone release 24-48 hours following deep intramuscular injection, which steadily declines to near baseline levels approximately two weeks later. For men recommend dosage is of 50-100 mg per injection every 3-4 weeks for 12 weeks for general anabolic effects. Deca Durabolin can be taken in the range of 200-600 mg per injection weekly for physique or performance enhancing purposes. It should be taken in cycles 8 to 12 weeks in length. This level is sufficient for most users to notice measurable gains in lean muscle mass and strength. It is often stated that nandrolone decanoate exhibits its optimal effect (best gain/side effect ratio) at 2 mg per pound of bodyweight/weekly, although individual response will likely dictate varying ideal dosage. for women, when used for physique or performance enhancing purposes, a dosage of 50-100 mg per injection every week is most common, taken for 4-6 weeks. Deca Durabolin has a low tendency to aromatize. But at higher dosage Stacking it with an anti-estrogen such as clomiphene citrate(Onivum) or Tamoxifen citrate may be necessary to prevent estrogenic side effects. At higher Dosage Deca Durabolin can be taken with an aromatase inhibitor like Arimidex (anastrozole), which more efficiently controls estrogen by preventing its synthesis. for dieting or cutting cycle combination of 200-400 mg/injection per week of nandrolone decanoate(Deca Durabolin) and 10-20 mg daily Stanozolol (Winstrol Depot)will greatly enhance the look of muscularity and definition. for bulk cycles, being a moderately strong muscle builder, nandrolone decanoate can be used with the classic " Deca Durabolin and D-bol" stack (200-400 mg per injection of Deca Durabolin per week and 20-50 mg of Dianabol per day). This combination always provides excellent muscle growth. for brutal mass cycles, stronger anabolic steroids such as Oxymetholone (Oxymeth 50 or Anapolon) or any Testosterone (Testosterone Enanthate or Testosterone propionate) could be stacked with Deca Durabolin. Deca Durabolin has low estrogen conversion rate of about 20% as compared to testosterone. But at higher dosages increased estrogen levels in the body can cause side effects such as increased water retention, body fat gain, and gynecomastia. In men elevated levels of Deca Durabolin are likely to produce androgenic side effects including oily skin, acne, and body/facial hair growth. Like all Anabolic/Androgenic steroids, It also has a tendency to reduce endogenous testosterone production. At higher dosage Strong virilising effect in women can cause deepening of the voice, menstrual irregularities, changes in skin texture, facial hair growth, and clitoral enlargement.